Jeero wants to hang out with you. Why? He needs you. Jeero thinks life is so complicated, so he needs you to comfort him. Wage and Babo ask him so many questions, and he isn't sure what makes them think he has any of the answers. Maybe they think his red nose means he's Jeero the wise. Well he's not! What time is it? Jeero has no idea. How do you get from here to there? Don't ask...Jeero doesn't know! Jeero just wants to sit on the couch with you and eat some snacks. Is that too much to ask? 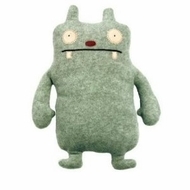 Jeero doesn't know, but he does know that it's time for you to cancel your plans and hang out with the Uglydolls.